i don´t know how many birthday cakes one get´s in life. maybe not one cake per year, but surely many. and how many birthday cakes can you recall spontaneously, even though every single one has been prepared and given with love? i promise you, nobody will forget this birthday “cake”. i guess if there would not be the chive decoration you would not become doubtful. it is not a normal cake. it is a sandwich cake. yes, and the cream you see is no cream, it is mayonnaise! inside you have bread layers instead of biscuit and between each layer a sandwich filling to your liking. so, if the birthday person or your picnic company likes sandwich, they will love this cake! unfortunately i can´t show you the sandwich cake from inside, because we had some difficulties to cut it into wedges. it was not photogenic anymore. the idea for this sandwich cake is from the very lovely blog farmette and there you can have a look on the gorgeous inside. i got most of the sandwich filling inspiration from farmette and added one of my favorite one, cheddar, black olives, mayonnaise and chive. but you are free to choose your favorite fillings or any new inspiration. next time i will prepare the sandwich cake, i will cut of the bread crust to avoid destroying the beauty of the cake while cutting it into pieces. for the decoration you can simply use what is available in the season. here comes how i prepared the sandwich cake for my mom´s birthday. again, happy birthday mom, we had a really nice day! to prepare the bread dough, sieve the flour in a large bowl and combine with the dried yeast. add the salt, sugar, water and oil and combine everything to an elastic dough. i recommend to use your fingers. if it is too sticky, just add a little bit more flour. cover the bowl with a dish towel and let the dough raise in a warm place until it has doubled its size. this may take at least one hour. divide the dough into three parts and make three equally sized round flat cakes, cover again and wait another hour. you can bake the bread in cake tins as you usually do it with sweet cake or simply on baking paper like a focaccia for example. the baking time depends a bit on the size of your tin. but it’s done when it turns golden. if you are not sure, prick inside with a wooden barbecue skewer. if nothing or only small dry breadcrumbs stick on it, they are done. i baked mine at 200° C for about 20 minutes. let them cool down and learn from my mistake, cut of the crust! now you can start to pile up the bread layers and one sandwich filling each time. finish with one bread layer on the top. for the icing, spread over the mayonnaise. decorate with herbs, flowers or whatever you like. 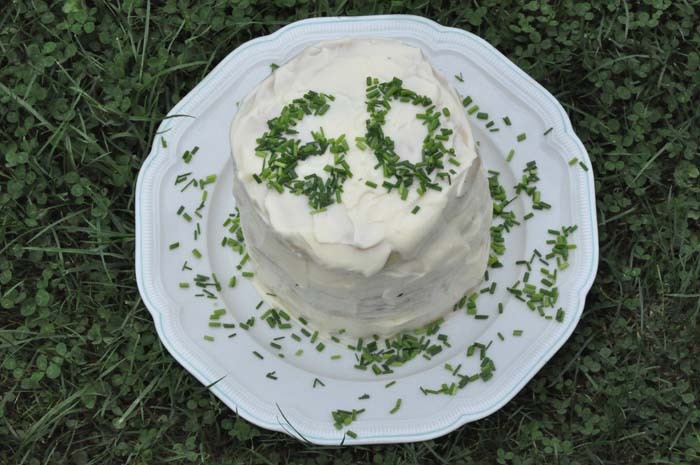 This entry was posted in recipes, spring, summer and tagged bread, cake, chive, rucola, sandwich by The Cook. Bookmark the permalink.